The Stokes' law calculator is a tool for analyzing the motion of a spherical particle in a falling ball viscometer. This device is just a vertical tube filled with viscous liquid. A small particle, when dropped into the tube, is subject to a drag force resulting from the fluid's resistance. If you measure the velocity it has at the end of the tube, you can calculate the viscosity of the fluid. This article will explain how to use the terminal velocity equation to determine the viscosity, as well as elaborate a bit on the viscosity definition. Viscosity of a fluid (gas or liquid) describes its resistance to shearing stresses. For example, honey, which is "thicker" than water, has much higher viscosity and hence is more resistance to shear stresses. The units of viscosity are pascal times second (Pa * s). If you want to visualize how viscosity affects a liquid, consider a stream of water and a honey flowing down the slope. Water has low viscosity, so it will move faster. The honey, on the other hand, will flow very slowly precisely because of its viscosity. μ is the dynamic viscosity of the fluid. You can use this terminal velocity calculator to find any of these values. If you need to determine the viscosity, simply input all other values in their respective boxes and you will receive the value you are looking for. 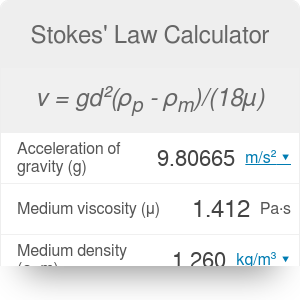 Stokes' Law Calculator can be embedded on your website to enrich the content you wrote and make it easier for your visitors to understand your message.